CHAPTER I. OF THE SCIENCE OF GRAMMAR. "Hæc de Grammatica quam brevissime potui: non ut omnia dicerem sectatus, (quod infinitum erat,) sed ut maxima necessaria."—QUINTILIAN. De Inst. Orat., Lib. i, Cap. x. 2. Speech results from the joint exercise of the best and noblest faculties of human nature, from our rational understanding and our social affection; and is, in the proper use of it, the peculiar ornament and distinction of man, whether we compare him with other orders in the creation, or view him as an individual preëminent among his fellows. Hence that science which makes known the nature and structure of speech, and immediately concerns the correct and elegant use of language, while it surpasses all the conceptions of the stupid or unlearned, and presents nothing that can seem desirable to the sensual and grovelling, has an intrinsic dignity which highly commends it to all persons of sense and taste, and makes it most a favourite with the most gifted minds. That science is Grammar. 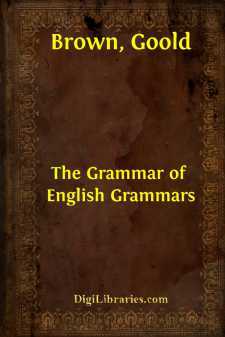 And though there be some geniuses who affect to despise the trammels of grammar rules, to whom it must be conceded that many things which have been unskillfully taught as such, deserve to be despised; yet it is true, as Dr. Adam remarks, that, "The study of Grammar has been considered an object of great importance by the wisest men in all ages. "—Preface to Latin and English Gram., p. iii.